Can i export to a data base in mysql? Manually, you can download your CSV report and export it to your MySQL database. If you want a process done for every submission, you will have to create your own script to do an SQL insert to your database. Of course, you will need your own Thank You page outside jotform to do the SQL insert query. To do this, you will have to set your JotForm to do post action after submission in the options. This will post all data going to your custom URL Thank You page. 3. Once the pop-up appears, click on Advanced Settings, you will see on Send Post Data is set to 'No'. Click on 'No' and it will change to a drop down. 4. Select Yes then save it by clicking the Green 'Close Settings' button. You're done with configuring your form! Now we setup the Custom URL Thank You page. This way you will be able to see the variables related to the values passed. Now you can use those variables to insert your query inside your thankyou page going to your database. The amazing thing about JotForm is that you can perform one task in many ways. It's up to you to choose which one will work best for you. The above suggestion by liyam is excellent. 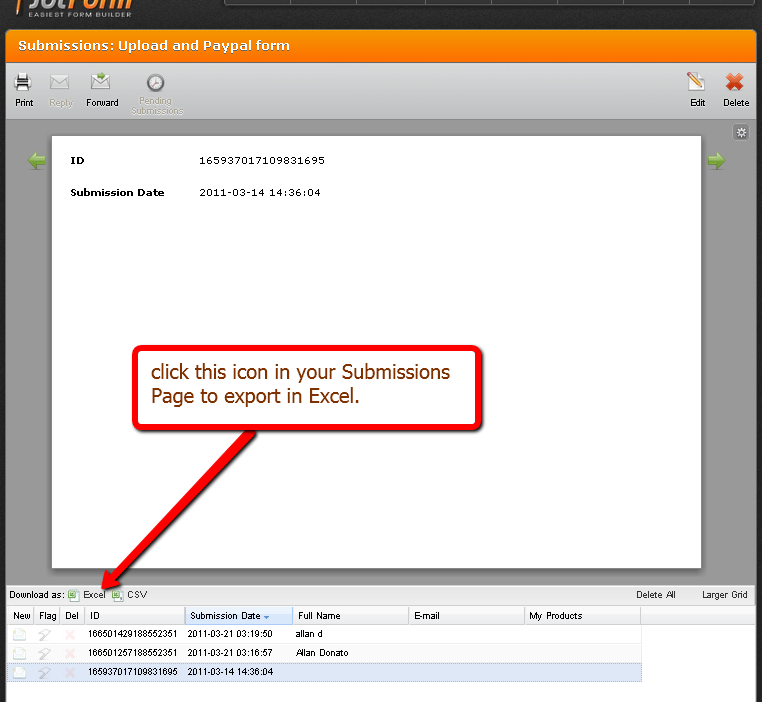 An alternative option for you is to export the submissions data found in the Submissions Page into an Excel file. Then import this Excel file into your mysql database. We hope these options will be useful for you. Thank you for using JotForm! I am reading this solution with great interest but need a little more clarification. I have a database that I use for scheduling appointments. When an appointment is made, I send a confirmation to the student with the url to a form that the student needs to complete prior to the appointment. It would be great if after the student completes and submits the form, the form data (pdf preferably) could be added to my database so that when the tutor sees the appointment, the pdf (containing student data) is available. Its not possible to update a mysql database automatically from a JotForm form submission. But you could write some PHP making use Form Post Data in a Thankyou Page with a Custom URL. I added an example of how to the Forms Post Data in one of the replies to the comments near the bottom. Posting to a mysql database with PHP isnt a million miles away from that, but would need a little bit of work on your part. Most of the components you need are in that guide and those little snippets of PHP above. I may at some point in the future create a user guide entry in how to insert data from JotForms form submission into a mysql database. I was just thinking about this earlier today as it happens. You'll be amongst the first to know when its done, Ishad. Liyam has put together a nice guide for us on posting JotForm data into a Mysql database, which should be some use to you, Ishad24.